Calculating valuation is both an art and a science. There are hard numbers you can estimate, but there’s also no way to accurately predict how much market share your team can successfully capture or at what rate a market is going to expand over the next ten years. That imprecision is what makes venture investing so risky—and so potentially rewarding. 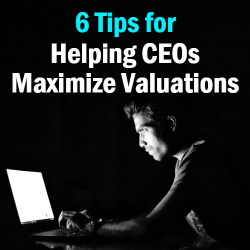 As a serial entrepreneur turned investor, I’ve taken part in valuation conversations on both sides of the table, and they’re usually tricky affairs. In my decade of venture investing, I’ve learned that if you, as a founder, want to drive the highest valuation possible for your company, there are some specific do’s and don’ts to follow. Don’t focus on your percentage of ownership. While your natural instinct might be to try to maintain the largest percentage possible of your company, you’re going to need help to grow the business. Sure, we love to idolize the Mark Zuckerbergs of the world, but the truth is, it’s very difficult to take your company from zero to IPO, and nobody does it alone. The right investor can coach you, introduce you to a great hire, connect you with game-changing customers, and more. Don’t sacrifice your growth to hold onto a certain percentage of your company. It will serve you better in the long run to have a small piece of a larger pie. Ask yourself which is better: 60 percent of a $10 million company or 20 percent of a $100 million enterprise? Don’t set unrealistic benchmarks. Building a company is a marathon, not a sprint. It takes time, and you need to have growth goals along the way. Your current and future investors will look at these milestones to assess your progress and reevaluate the valuation. Setting these goals is also an art—too high and you’ll miss them, too low and accomplishing them will be meaningless. But err on the side of caution. Investors will be much more comfortable investing in later rounds if you’ve surpassed your customer acquisition goals for the last three quarters. On the other hand, loss of momentum is the biggest red flag. It’s not impossible to recover from, but it will certainly negatively impact the valuation down the road. While double- or triple-digit annual growth is fantastic, the most important is positive traction. What investors want to see is a steady trajectory of progress. Don’t commit to an investor who won’t commit to you. There are several approaches to operating a fund. At BIP Capital, we ascribe to the philosophy of tranche investing (tranche is a French word that means to portion or slice). We invest a certain amount and release those funds in stages as the company hits predetermined milestones. This approach keeps us actively engaged with each of our investments and dedicated to helping founders achieve their goals. Some firms adopt a one-and-done method, where they invest all the money up front. While at first glance that might seem a more attractive option, that type of fund structure usually comes along with both slimmer valuations and stricter parameters on getting X return in Y timeline. Be sure your investor is truly invested in the growth of your company over the long run. Research your options. Knowledge is power. The more you can uncover about your potential investors, the better equipped you are to drive a favorable valuation. Connect with founders in your network who have relationships with your target firms and get all the information you can from them. What other recent deals have they done? How connected are they in your company’s market? How confident are they in their ability to accelerate your growth? Do your homework to find an investor who’s an expert in your space, because they’ll be more comfortable managing the risk and thus more likely to place a risky bet in your favor. Consider the lifetime of your valuation. Think you can get away with one round of funding before your company is profitable enough to be self-sustaining? Excellent. Make that case to your investors and you’ll earn yourself a greater valuation. More often than not, companies need more than one round of funding and your valuation gets reassessed each time. Set yourself up for success from the start by taking careful consideration of how further dilutions might impact your stake in your company. Expect 20-30 percent dilution of your ownership each round, and plan accordingly. Prioritize customer success over everything. The best thing you can do for your valuation is to demonstrate the value of your company through your customers. Simple, right? A solid product-market fit for a sticky product is a goldmine, and investors will count themselves lucky to have an opportunity to work with you. But the only way to create a product customers love is to talk to the customers themselves. And to keep talking to them. Craft everything you do around a better understanding of your customers’ needs, and you’ll be armed with a deal investors won’t want to walk away from. Cres Ferrell is Vice President at BIP Capital, a venture investor in the Southeast serving entrepreneurs, investors and operators. Cres currently focuses on SaaS businesses and how to apply their growth to new markets. A non-traditional VC, Cres began his career in engineering after graduating from Georgia Tech, and went on to spend 15 years working for corporations in manufacturing, retail, consumer products, business services and consulting. Cres established himself as a successful entrepreneur after building and selling two prior companies - COLDfire Technology and 4th Strand, with a greater than 50X return to investors. Follow Cres on Twitter @cresferrell.